Fewer than half of Americans approve of the job President Obama is doing, although his approval rating is slightly up since last month, according to a new CBS News poll. Nearly as many people disapprove of the job he is doing. Mr. Obama's overall job approval rating has remained below 50 percent since April, and this month is no different. Now, 48 percent approve, while 44 percent disapprove, according to the poll, conducted Aug. 20 - 24. His approval rating has inched up from 44 percent last month, and is similar to what it was in June. 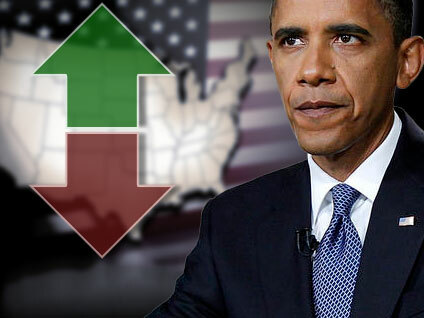 The president continues to receive net negative ratings on this handling of the economy - the nation's top concern. Forty-eight percent disapprove of his handling of it, while 44 percent approve. Meanwhile, the poll shows views of the economy remain bleak: four in five Americans think it is bad, and now 34 percent say it is getting worse, an increase of eight points since last month. While most Americans (59 percent) think the economy will eventually recover, more than a third think it is in permanent decline. A majority (75 percent) thinks the recession will continue another two years or more, similar to last month. Forty percent of Americans are very concerned that someone in their household may lose a job over the next year, up from 31 percent last month. When asked who or what is to blame for high unemployment, 18 percent volunteered that politicians generally are at fault. Fifteen percent blamed the policies of former President Bush, while 5 percent blamed the policies of Mr. Obama. Seven percent blamed "outsourcing," while another 7 percent blamed business executives and CEOs. On the specific issues asked about in this poll, Mr. Obama receives his highest approval rating on his handling of Iraq - 52 percent of Americans approve of his handling of that issue. Forty-three percent of Americans approve of the president's handling of Afghanistan; thirty-nine percent disapprove. Fifty-six percent of Americans say the Bush tax cuts for people earning over $250,000 per year should be allowed to expire. Americans are almost evenly divided as to whether the law should be changed so that babies born to illegal immigrants do not automatically become U.S. citizens. Forty-nine percent say the law should be kept as is, while 47 percent say it should be changed so that children born to illegal immigrants do not automatically become citizens. Seventy-seven percent think the U.S. could be doing more to stop illegal immigrants from entering the country. Forty percent of Americans think gays and lesbians should be allowed to marry legally, while three in 10 think they should be able to form civil unions. Twenty-three percent of Americans have a favorable opinion of Sarah Palin, while 40 percent view her unfavorably. Twenty-nine percent of Americans say they are supporters of the Tea Party movement.